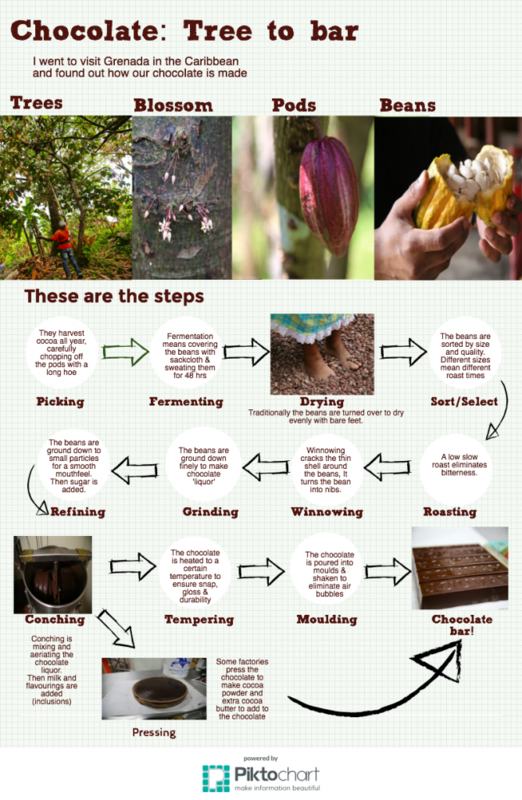 Cacao pods come in three main varieties: Criollo, Forastero and Trinitario, the latter a hybrid of the first two. Recent gene tests suggest there are at least ten types, however. Cacao trees originated in South America but are now grown in Africa, the Caribbean, South East Asia, Central America and Northern Australia but all within 20 degrees of the Equator. Their favourite kind of terrain is hot and sweaty. 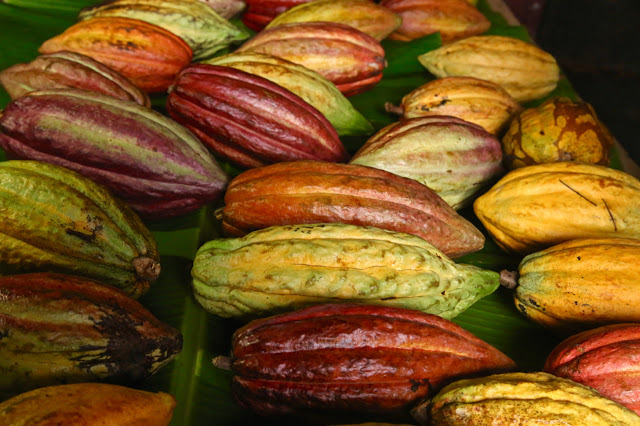 Grenada (pronounced Grenaida, not Grenahda, which is in Spain), a small volcanic island to the south of the Caribbean, almost off the coast of Venezuela, has some of the very best quality cacao pods. Why? The type: Trinitario and Criollo. The soil: volcanically fertile, rather like in Sicily. The weather: a steady, damp warmth. 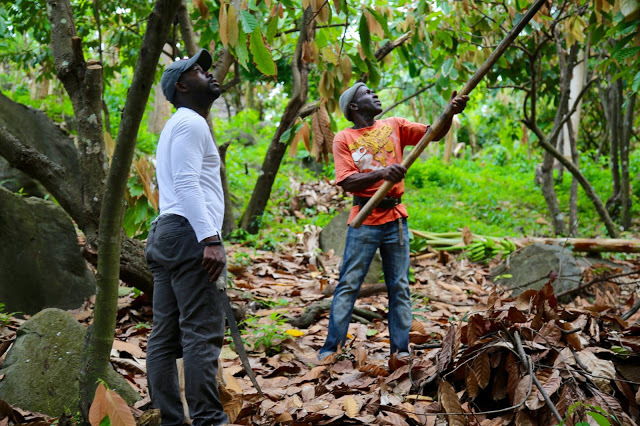 Cocoa farmers earn very little. Across the world, child labour and starvation wages are used to produce your yummy chocolate bar. Many cocoa farmers have never even tasted the chocolate that their cacao beans go towards making as they simply can’t afford it. Although chocolate is becoming increasingly popular, cocoa bean yields are under threat due to climate change and farmers ageing out of the system. 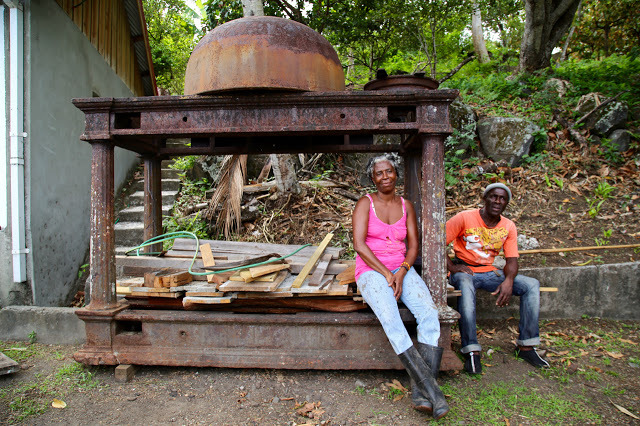 In Grenada, just as in the UK, most farmers are above retirement age. Their children don’t want to take it on – the work is hard and the wages are low. The money earning bit, the added value, is when you make chocolate from the beans. Compact and less expensive machines have recently made this possible on a small scale. 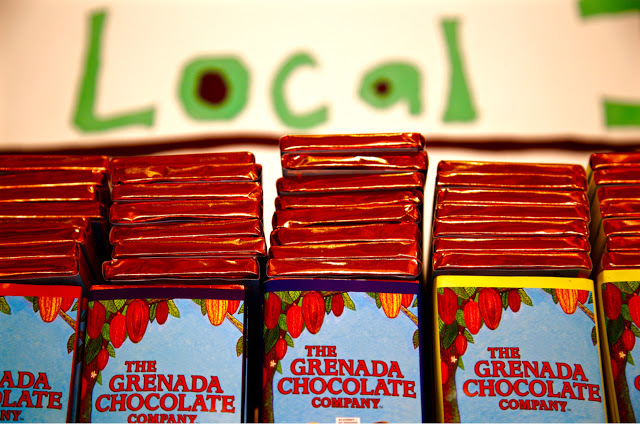 As a result, there are now three chocolate companies in Grenada. 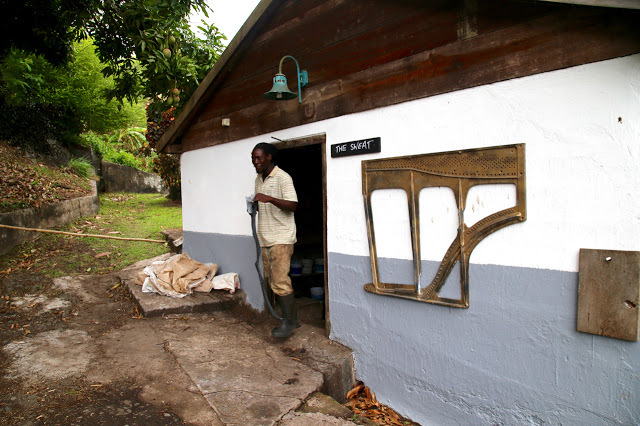 The Grenada Chocolate Company. Started by British entrepreneur Mott Green, who unexpectedly died when electrocuted at his factory. It’s taken them a while to get back on their feet but, with the help of a new American factory manager, they are back to producing very fine chocolate a few metres away from where it is grown. You can buy their chocolate at Rococo Chocolate branches. 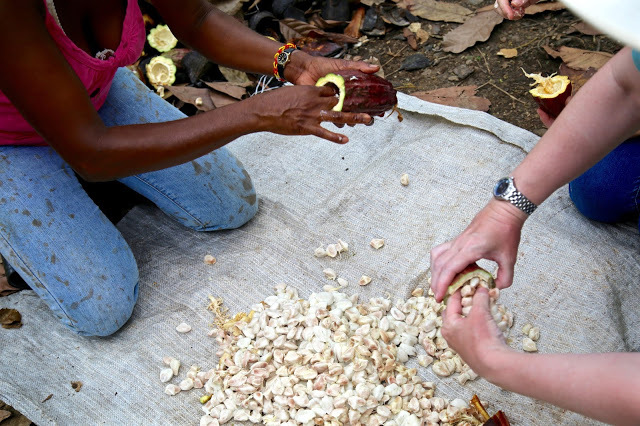 Rococo’s owner Chantal Coady OBE has been supporting The Grenada Chocolate company since 2002 and donating cocoa from Grococo farm on Grenada since 2007. Diamond Chocolate Factory. Makes Jouvay bars. (The ginger and nutmeg bars are particularly divine.) Their entire factory looks like something from the Kitchen Aid era, gorgeous rounded cream and chrome machines with 1950s design. It’s a pretty factory. Crayfish Bay chocolate. New to the bean to bar manufacturing but, despite their cobbled together equipment (they are using a kind of barbeque to roast the beans), they are already producing fantastic quality chocolate bars. They also sell to Pump St Bakery. Magdalena Fielden, Mexican owner of the True Blue Bay Resort, has started an annual Chocolate Festival with her British husband to promote the high quality cacao from Grenada. Cacao is now the biggest cash crop on the Spice island, since the devastating hurricane Ivan of 2004 destroyed 90% of their former most important export, the fruit of nutmeg trees. The actual trees are beautiful, with large oval reddish-brown and green leaves. The pods grow directly from the trunk, improbably hanging from thin stalks. When unripe they are purple or green, turning orange and red as they ripen. The pods start out as tiny white flowers, which are pollinated by sandflies. Cacao beans are harvested throughout the year but the main crop is in the spring before the rainy season, which starts in June. The pods don’t just fall from the tree, they are chopped off with a long Dutch hoe. The trees are interplanted with other trees, papaya, nutmeg, bananas, coconuts and small bushes such as pineapple plants, and the forests are checked every few days for ripe pods, those that are orange or gold. Each pod contains 30 to 40 white beans. 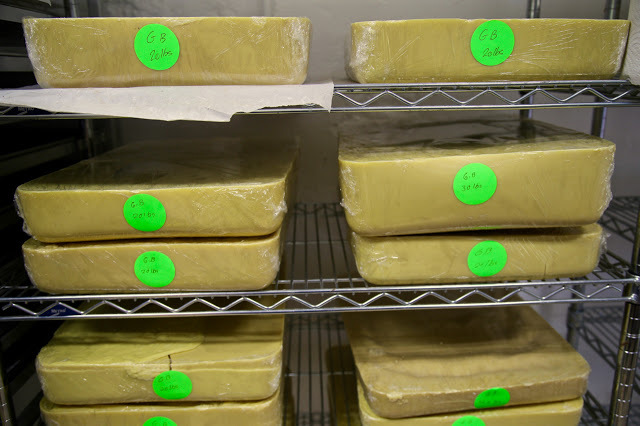 A kilo of beans makes 24 x 50g bars (1200g chocolate). 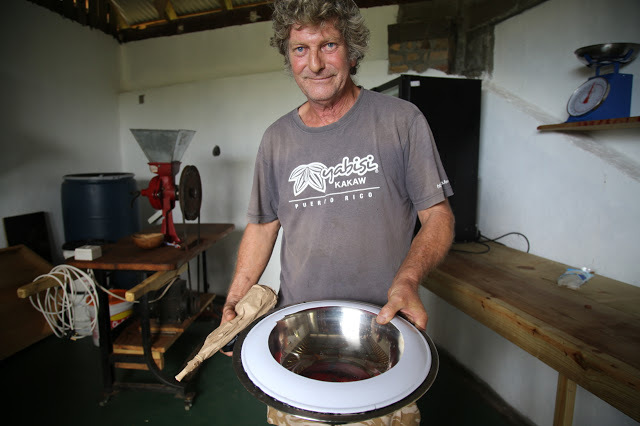 I worked as a cacao farmer for a couple of hours at the Crayfish Bay farm run by a couple, Lylette, a Grenadian woman married to an Englishman named Kim Russell or, as he prefers to be known, Captain Chaos. He is missing a toe and most of his teeth. You know about the toe because he rarely wears shoes. Kim gave us a great talk on slavery – along the lines of ‘slavery didn’t stop because the white man suddenly became a nice person, it stopped because it was no longer profitable’. This is hard, hot work. Once cut down, the pods are gathered into piles. Using a cutlass the cacao pods are cut in half, the thick skin discarded into another pile, and the creamy sticky beans gathered into buckets. The cacao fruit itself is delicious, rather like a custard apple. The pile of cacao rinds is left to rot, attracting more sandflies, necessary for cross fertilisation. Kim’s farm is more like a cooperative. He profit shares with his workers, who take 90% of what their crops make. The day I went, he made us a delicious lunch of homemade bread, callalou soup (a Caribbean spinach) and a rice salad. You can rent rooms there if you want a farm visit. I don’t think I could be a cacao farmer. It turns out that sandflies adore me, and I ended up covered with hundreds of small itchy bites despite wearing repellent and long sleeves. These tiny midges are called ‘no-see-ums’ because – yes, that’s right – you can’t see them. For the first 24 hours, you don’t feel too bad… then the itching starts in earnest. I’ve still got the scars. Locals told me that if you live there, you develop an immunity. Beans can be sold ‘wet’ or ‘dry’. If they are sold wet, the factory ferments and dries the beans. Wet weight beans are white and weigh more than the dried brown beans and are therefore sold at a lower rate per kilo. The wet beans are kept in a bin covered with banana leaves or sackcloth to ferment for up to 48 hours. Then the beans are turned every day for 4 to 7 days to ensure that the fermentation temperature is evenly distributed. Careful handling of this part of the process is essential for the end flavour. 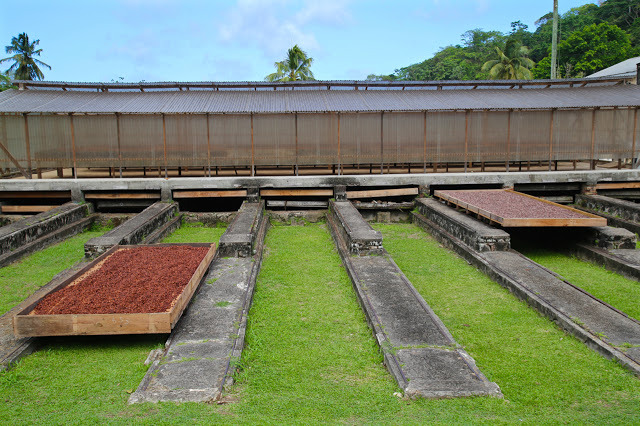 At the Belmont Estate in Grenada, we saw the beans spread out in the sun to dry. This usually takes 4 to 14 days. Traditionally, young women in cotton dresses dance while shuffling their bare feet through the beans to ensure even drying. Nowadays this is mostly done with rakes. 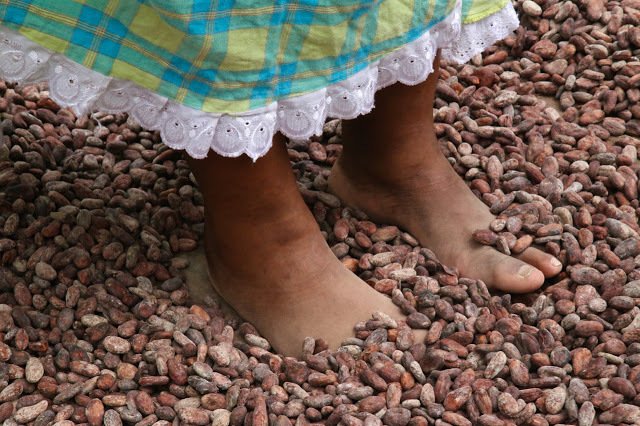 Cacao beans are sorted into different sizes, ones with blemishes are removed. The size of the bean is important to determine the length of time for roasting. The beans are roasted. Like coffee, this is an important part of the process when it comes to the end result, the taste of the chocolate. A low, slow roast is sweeter, less bitter. After crushing, the thin shell separates from the beans and air is used to separate the shell from the pieces of the beans called nibs. Nothing is wasted; the shells can be used as mulch and some beans are retained in nib form. I personally love a large pinch of cocao nibs to get over a mid-afternoon energy dip. The beans are ground up. I saw this at the Diamond chocolate factory in Grenada. It goes in as crushed up beans and comes out as a fine paste, cocoa liquor. Grinding the cocoa liquor until the particles are tiny, leaving a smooth mouth feel. This is when the sugar is added. Mixing thoroughly while heating and aerating to create a smooth chocolate. This also reduces the acidity in the cacao bean. Prior to tempering, flavourings, lecithin, milk or extra cocoa butter is added. 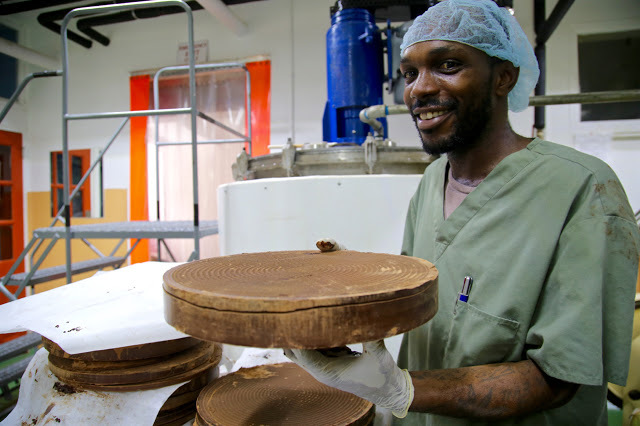 In factories that wish to produce the extra cocoa butter rather than buy it in to add to chocolate bars, a machine presses the chocolate into ‘cakes’ and extracts the cocoa butter. The liquor is separated into approximately two halves: 1) dry chocolate cakes, which are made into cocoa powder; 2) cocoa butter, some of which is used in cosmetics and some of which is added back to the refined and conched chocolate. A cocoa bean contains 45% cocoa and 55% cocoa butter. A process of removing crystals from the chocolate by heating a portion of the chocolate to a certain temperature, then adding unheated chocolate. Tempering is important to create the characteristic snap and gloss of good chocolate and to render it more heat resistant. The liquor is poured into moulds and shaken until the liquid spreads all over the mould evenly, at the same time getting rid of air bubbles. These moulds can take the form of a chocolate bar. How much chocolate and cocoa butter is there in a Cadbury’s bar? Cadbury’s contains 23% cocoa solids, which is not terrible. But ordinary, mass produced chocolate bars use ‘bulk chocolate’, not high quality stuff, and are filled out with vegetable fat rather than cocoa butter. Why do Hershey bars taste awful? What do they mean when they say a percentage, say 70% of cocoa, is in a chocolate bar? 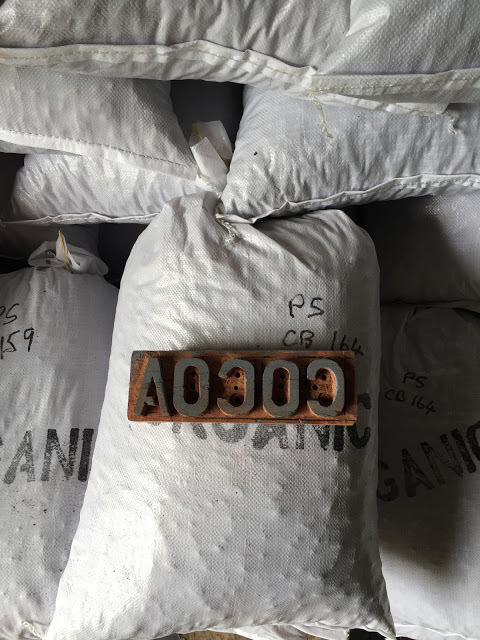 It means that 70% of the bar is cocoa solids and 29% is sugar. The other 1% is vanilla and flavourings. N.B. : the 70% of cocoa solids may have different ratios of dry cocoa to cocoa butter. Yes, it is. Though not the cheap stuff from the local sweet shop, only the expensive dark artisanal chocolate. That helps reduce appetite, raises magnesium levels, boosts serotonin, makes you look younger. If I spread chocolate all over my face and body on the outside, is that a good thing? I’ve done it. I had a ‘chocolate spa’ in which I was painted from head to foot with dark chocolate, then wrapped in cling film, then foil and left to bake for 20 minutes while a soothing soft voiced Grenadian woman massaged my temples. Then I washed it off in the adjacent shower and was subsequently rubbed all over with cocoa butter and peppermint oil. I smelled like an After Eight. I felt soft and fragrant and according to others, instantly looked ten years younger. Recommended. What does Fair Trade mean? Is it fair? Fair Trade ensures that farmers get a fixed price for their crop throughout the season. 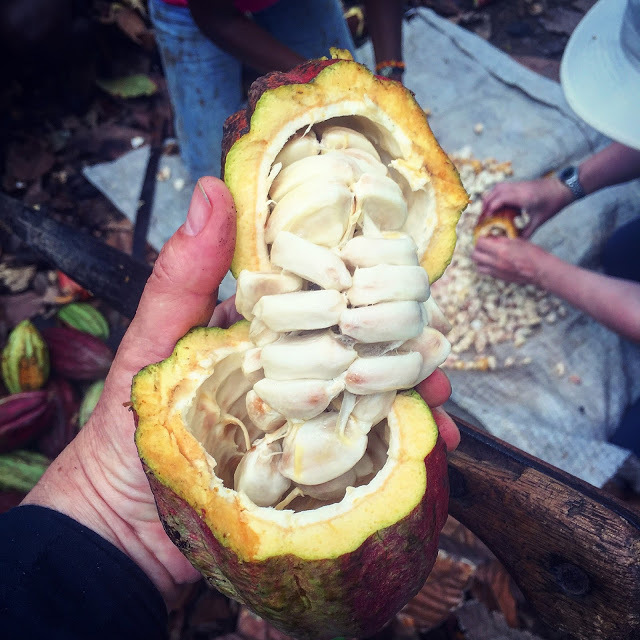 There have been times in Grenada where it’s virtually not worth picking the cacao pods due to the low price of the crop. Farmers should get a higher price for their crop but membership of Fair Trade is too expensive for some. 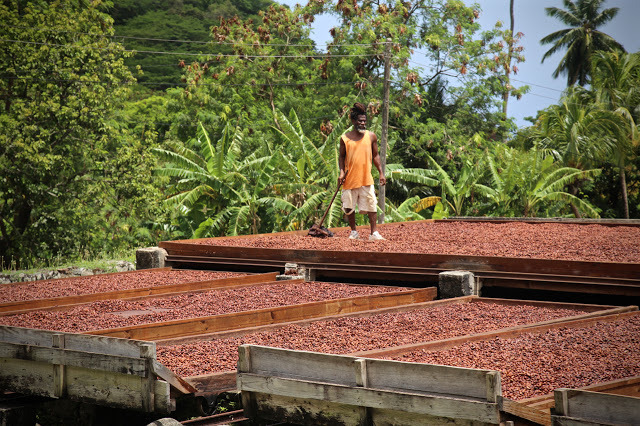 Small scale cooperative schemes such as those at Crayfish Bay farm and The Grenada Chocolate Factory get rid of the middle man and motivate workers. Buy Grenadian chocolate! Check out my handy infographic at the top. Best article on chocolate ever. Thank you. I really enjoyed reading this. What a fantastic experience! Hershey.. yuk. But i agree on Cadbury's as well as,fair to say, mass produced chocolate anywhere (Ferrero rocher anyone?). it's the ingredients, isn't it. Plus for years I have been on a crusade against palm oil. out with Nutella, in with Galamella! Wow so they use pounds rather than euros to buy it? How odd. But I have to admit I do love Cadburys. I know it's not the super adult, high quality stuff but it's what I grew up on. Have you tried Cadburys with Daim bar in it? Bloody loverly. I'm trying to control my sugar intake right now though. Dark chocolate is more like a medicine, a couple of squares and you've had enough. It's so rich. Yes apparently they use pounds… odd. Haven't tried Cadbury's with Daim… will look out for it! and on dark chocolate, I totally agree. it's my treat, after dinner. At the moment I am loving Doisy & Dam… so delicious. 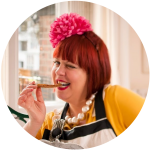 Don't know that chocolate but if you can get hold of Jouvay's ginger chocolate, it's to die for. Yes I don't know much about them except that my mums bff was married to one and he was a complete drip who ran off with an Eastern European hussy. But he made a lot of money out of the whole thing.